A lot of people don’t believe this, but I read every single email that lands in my inbox. My favourite emails are the ones from my readers! Especially the ones that ask for help or need advice, because it shows signs of wanting to grow and learn. Not so long ago I was sent an email asking for help on how to make “my business look more professional”. Branding is more than just a logo. It’s your colours, fonts, visual representation online, as well as the experience, tone of voice (in email and calls), and the way you engage with your clients, potential clients, colleagues, and peers. Your business may be small, but ensuring you brand it powerfully can make a big mighty difference. Don’t worry, I know it sounds daunting, but it really doesn't have to be. In a nutshell, an elevator pitch is a one-liner that is informative, precise, easy to understand, and explains who you are, what you do and who your target audience is. I find that being able to describe this quickly not only build my confidence in me and my business - in a non-salesy way - but it also makes me sounds professional about my business. 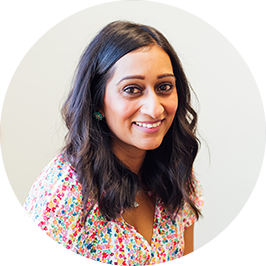 My one-liner goes along the lines of “Hi, I'm Krishna Solanki, of Krishna Solanki Designs - I know, bit of a mouthful - I design strong brands and beautiful websites for startups and small businesses”. Being able to refer potential clients and customers to find out more about your offering is something that every business owner should definitely have on their list of business setup tasks/to-dos. Not only is it a fabulous marketing tool, but it’s an extension of your brand as well and will definitely make you look professional. Starting off with just a domain name is fine too - as long as you build it into a usable, informative, functional website that works for your business. Don’t forget to collect testimonials or kind words from your customers and clients - these are great to add to your website! Along with your website, your email address is another aspect that should be professionalised. The interaction your customers or clients will have with you and your business via your email can make or break your professional image. Would you trust an email from kri5hnasolank1982@hotmail.com or hello@krishnasolankidesigns.com? Which one appears to be more professional? I can tell you right now, the later is the most professional out of the two and therefore is more trustworthy. Feel free to skip this point if you're a web designer if you’re not… keep reading! Making sure your website works for your business is key. You want to be able to prioritise the elements that are key for each page, and also organise your pages in a manner that is easy to navigate and user-friendly. A professional designer, like me, can help by making sure you save time by allowing you to concentrate on what you do best. Plus, a professional has the design skills to use the right software too. (Feel free to drop me a line if you want to work together). Print collateral, including business cards, is just as important as online branding. Getting professionally ordered and printed business cards can do wonders for your face-to-face networking or even when you are just in a friendly conversation. It’s great to just carry a bunch of cards and if the conversation ever arises you are prepared to hand them out. I hope this post helps you professionalise your business, what do you think could help your business look more professional? The shop is open and new products are being added often, so don't be shy visit the shop or sign up here to find out when more beautiful printables are added.